« My New Favorite Books, or, IT’S REESE’S PUFFS CEREAL!!!!! Two days ago, I had the good fortune to see an advance screening of Scott Pilgrim Vs The World. When I left the theater, I had the distinct impression that I had learned a lot, about movies, about games, and about culture, and it’s taken me a couple of days of near constant thought to suss out my feelings about it. So, is it good? Maybe. I certainly enjoyed myself. But I couldn’t help but feel that Scott Pilgrim succeeded in all of the ways that I expected it to fail, and failed in all of the ways that I expected it to succeed. So why did I like him anyway? Was it because I’d read the graphic novels, and knew that there was more to him than that? No, not that. Was it because Scott himself is funny and often confused? No, it’s not that either. The fact is, I was completely drawn in by what the film does well. 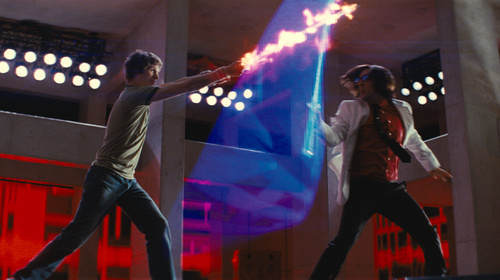 Scott Pilgrim vs The World is designed as a mechanism to elicit a very specific Pavlovian response in video gamers. When a film opens with a pixel-art Universal logo and an 8-bit rendition of the Universal fanfare, and the first shot of the film is scored with a piece of music from The Legend of Zelda, how else can a gamer respond? As characters are introduced, VH1-esque pop-up boxes appear, detailing their “stats”. Game sound effects permeate the soundtrack. Basic character activities like changing clothes are time compressed within scenes, giving the impression that Scott has gone into the menu, equipped some new items, and jumped back in without a pause in the action. Every comically violent death is accompanied by a shower of coins and a reward of points. The story structure itself is a giant homage to fighting games, comprising mainly of boss fights punctuated by cut-scenes that exist only to move things forward to the next battle sequence. As a gamer, I loved it all. I laughed at every joke, I made little “squee!” noises at every reference, and I relished the fact that someone had finally made a film that spoke to the shared cultural memory of my people. It made us Heroes. But what I hate is that it attempted to honor us with a story and characters that mimic only the most facile and simplistic game experiences. All of the beautiful complexity and unique philosophical depth that I know that games are capable of was left by the wayside. And while I know this was a conscious decision to keep the film accessible (far more people have played the classic, yet simplistic, games referenced in Scott Pilgrim), I can’t help but be disappointed by the fact that gamers will be identified with such a weak film. Scott Pilgrim vs The World is cute references and funny in-jokes held together with a duct-tape and chewed gum plot. It’s enjoyable fan-service, but this formula does not a compelling movie make. Don’t expect very many positive reviews of outside of gaming culture. 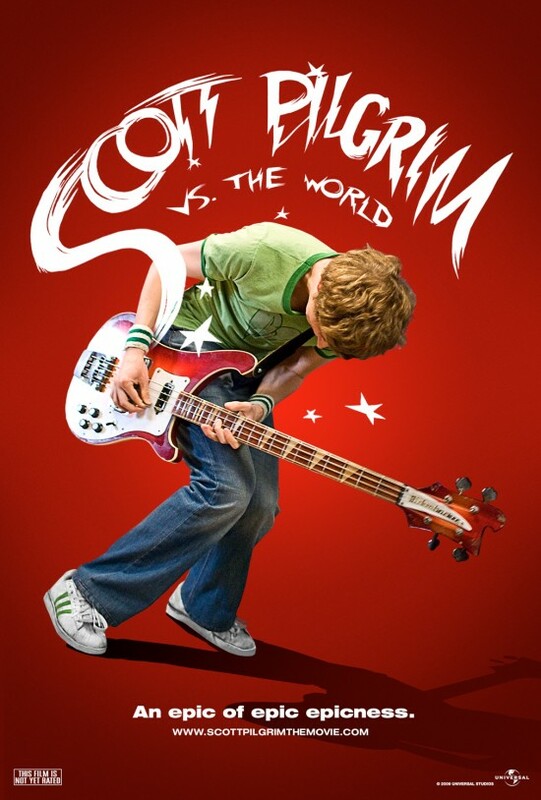 Scott Pilgrim won’t win the mainstream over. A note, as mentioning this did not really fit within my review: I’m curious as to how many other critics notice what I think is one of the most interesting “torch-passing” scenes I’ve ever seen. In a certain scene in the film, game tropes are put on the backburner, and television sitcom references (especially Seinfeld) take the center stage. It seemed so out of place, until I realized that it’s there as a cultural key. “Look at this scene,” the director seems to say, “If you don’t understand what we’re doing here, look at this scene. Now do you understand?” I thought it was interesting. This entry was posted by cwknight on 07/28/2010 at 13:26, and is filed under Culture, Observation. Follow any responses to this post through RSS 2.0. You can leave a response or trackback from your own site. To be perfectly honest, I kind of felt that about the books. I thought they were fun but I found a lot of it to just be…shallow. I have no doubts that I’ll enjoy the movie, but I imagine I’ll find it semi-entertaining for the cute references and neat graphics, rather than for the characters or plot. Maybe I just don’t “get” Scott Pilgrim. I guess to explain it best: Scott Pilgrim to me is basically just casual gaming. It’s a couple hours of Bejeweled. Nothing wrong with it, but nothing I would get excited about. PS: Emo, if you ever read that comment, please don’t hate me.